Want a salad that will make your guests GASP!!! when they see it? My eyebrow raised, “A white salad? Do tell.” When she told me what was in it, I decided to make one. I thought we’ve had a lot of snow this brutal winter and the last thing anybody wants to see is a salad that looks like a snowball, but I thought it would look really striking as well. This is a pretty easy recipe, but it’s easiest made with a mandoline and a sharp knife, depending on which vegetables you choose. I called this a winter salad because I made it in the winter. It looks a little like a snow ball or, as a few people thought when they saw the photo, a white chocolate truffle rolled in coconut. Shred the vegetables, on a mandoline, or slice them thinly. Mix the vegetables with kosher salt, white pepper and Creamy Parmesan Dressing. Arrange salad by fanning the cauliflower in a circle and piling remaining salad in the middle of the plate. 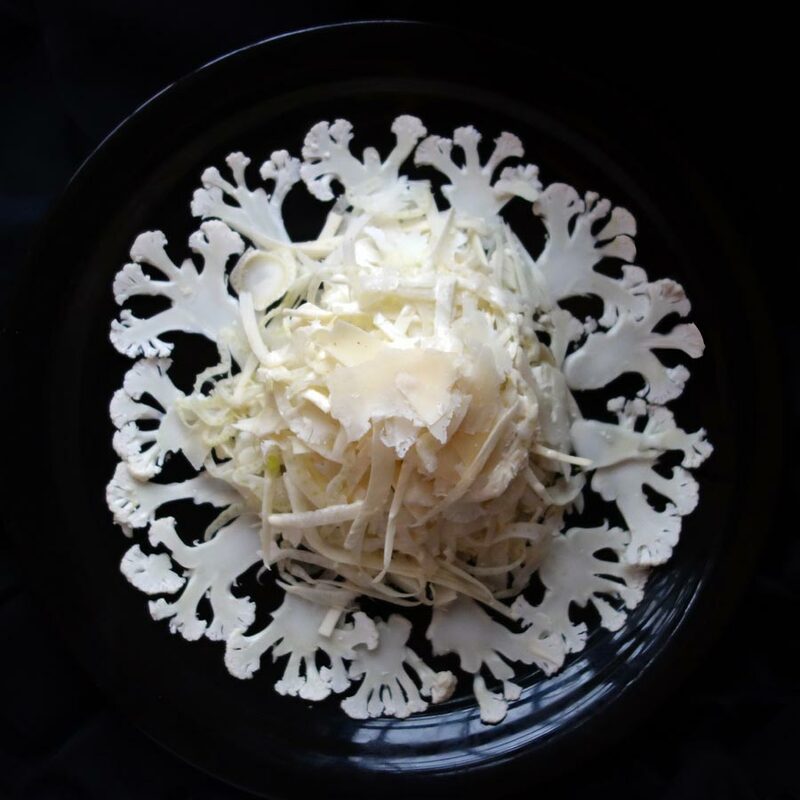 I used white vegetables (parsnips, fennel, cauliflower, Jerusalem artichoke and jicama), but you could also use other fruits and veggies like white radishes, endive, kohlrabi, pears, Vidalia onions, cabbage, apples, celeriac, white asparagus, cooked potatoes, daikon radish, white mushrooms, etc. The white salad stands out beautifully on a dark platter. How gorgeous would it look against thinly sliced red, yellow and purple roasted beets?